Seasonal trends suggest a modest rally but likely not to profitable levels. With global soybean supplies at record levels and wet weather pushing farmers to add acres this spring, rallies wouldn’t seem likely. Yet seasonal trends point to just that in April and May for both old and new crop contracts, whose charts are on the verge of upside breakouts. For growers the questions are how much of a rally to expect and what to do about it. Answers may not make any choices easier. But get ready to do something, because there’s no clear view when the next selling opportunities may come. Despite the overall bearish fundamentals for soybeans, both July and November futures typically rally. My studies of seasonal selling patterns highlight the second week of April – right now – and the third week of May. Moreover, despite all the uncertainty and angst facing the market over the past six months or more, prices aren’t embedded in bearish trends. Even with a rally, pulling the trigger on new crop sales is likely to mean a loss. With the average U.S. cash cost for 2019 projected around $9.20 an acre, $10 futures or more would be needed to offset anticipated weak basis. My forecast futures selling price target for new crop is only from $9.42 to $9.79 currently. So reaching a profitable level won’t come without a change to supply or demand. Demand might shift a bit if China decides to buy much more aggressively than anticipated in the coming year. Supply, of course, depends on weather, mostly. Neither factor won’t change for a while. But most growers likely can sell old crop at a profitable level overall, when previous sales are factored in along with Market Facilitation Program payments. Wrapping up old crop now seems prudent, especially with so much risk left on new crop. Hedging with July HTAs or futures may be necessary to wait for basis to strengthen a little, due to disruptions caused by weather. A record book of unshipped sales must still be moved, which should support values, especially when farmers are busy with fieldwork. If China adds to purchases, buying may come in new crop positions, which is where the real debate is. I’m forecasting exports to improve by 120 million bushels in the coming year. One key metric is from what base Chinese demand will grow. Higher costs due to tariffs, African swine flu and the push to lower the amount of protein in feed rations could cut China’s imports by 13% this year. USDA stuck to its forecast for around a 6.5% reduction. Imports in the first half of the marketing year were down 18%, with more data due later this week. 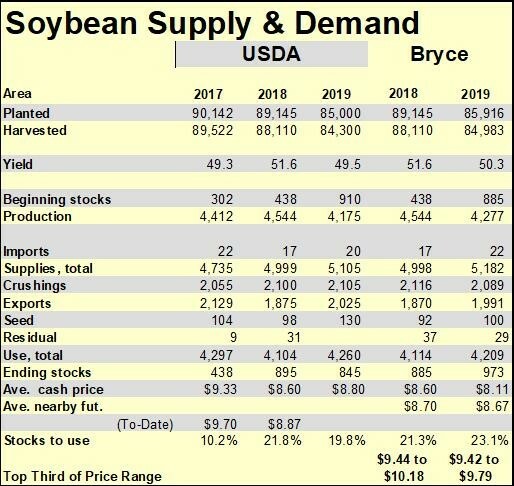 But until the market fears stronger demand or lower supply, projected 2019 crop ending stocks look likely to rise. That should keep soybeans on the defensive. Without a change in supply or demand, soybean carryout is likely to grow in the year ahead, limiting rally potential. 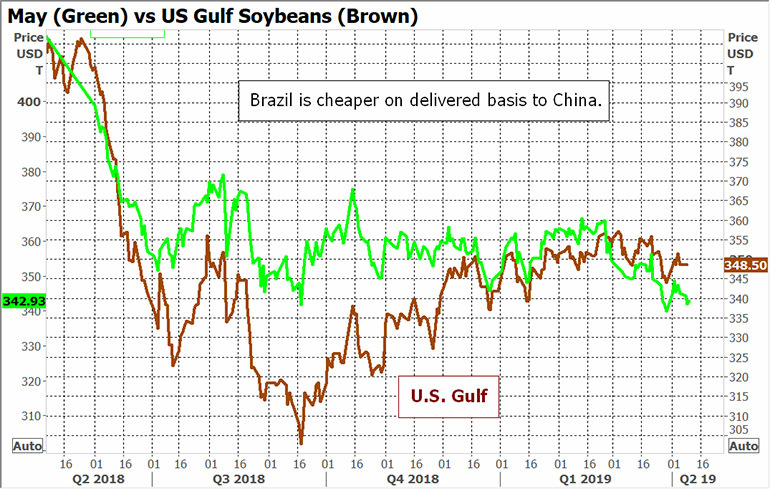 Soybeans delivered out of Brazil have a slight cost advantage, which could limit additional sales to new crop. 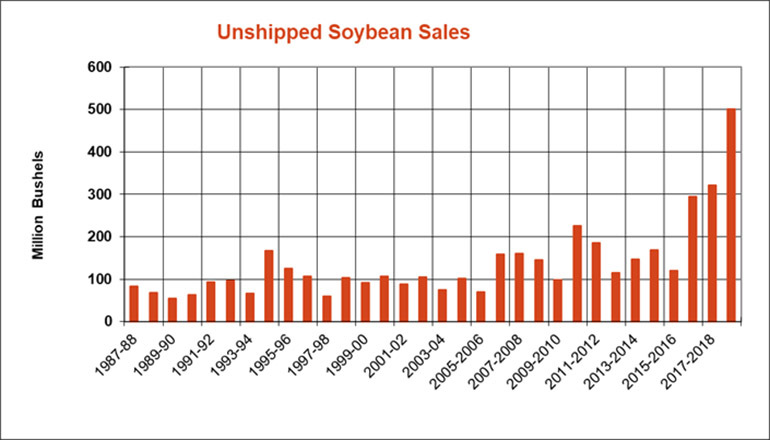 Strong buying from China since trade talks ramped up in December has unshipped soybean sales at record levels, which could support basis eventually. 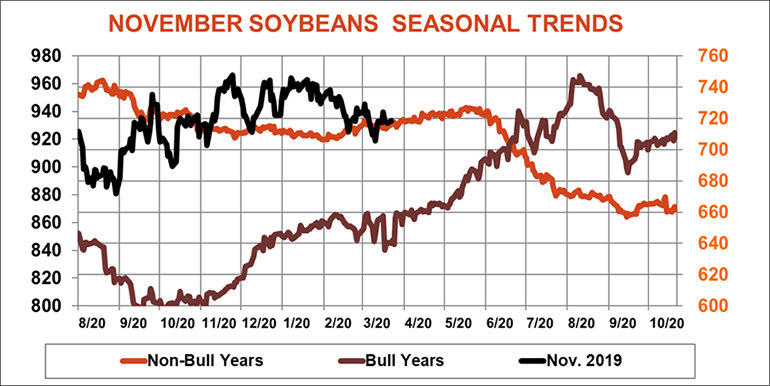 November futures shows a seasonal tendency to rally in to mid-May, even in years of good production. 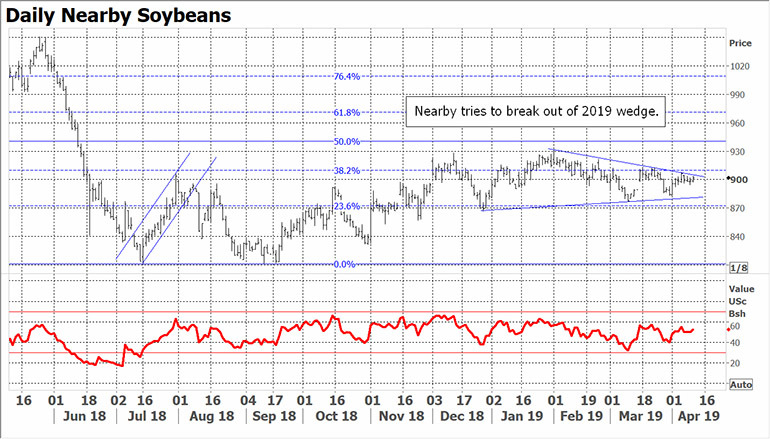 Old crop futures could be poised for a breakout, with the nearby trading in a narrowing range for 2019. Click the download button below for a pdf version that has complete fundamental, weather, futures and seasonal charts.